A clearinghouse should function similarly to a public utility. Like utility customers, clearinghouse clients expect extremely reliable service and rapid support if there is a service outage. Clearinghouses must be able to swiftly adjust to payer related problems and communicate with clients when downtime is expected or when a problem is detected with the data provided. In all cases, changes to levels of service needs should be handled by a knowledgeable and helpful customer representative. Etactics’ IntelliClaimⓇ clearinghouse provides this level of service. Solve common problems through claim scrubbing, eligibility verification prior to claim submission, in-portal claim editing, and workflow management. While some practice management systems are robust and independent, others lack needed or desired functionality. In such instances, a modern clearinghouse covers the gaps between what is needed on a claim and what the HIS or PM system natively generates. Our client managers are with you from day one including implementation and ongoing support. We simplify and streamline the enrollment process including the verification of the receipt of ERAs and calling the appropriate payer on your behalf if there are problems. After training, client managers are always available to answer any questions by email or phone. For more information, check out our testimonials and customer experience brochure. Our standard claim scrubbing service applies appropriate edits to your claims, including National Coverage Decisions (NCD), Local Coverage Decisions (LCD), and Correct Coding Initiative (CCI). Affected claims are returned to you promptly for corrective measures. These claims can be worked in our portal or from within your PM or HIS system by importing an ANSI 277CA file. Clients can also request custom edits, which can filter and highlight mistakes then place affected claims into a work queue for correction. Alternatively we will correct the claim automatically before and continue with the submission. Workflow and business intelligence improvement in identifying and appealing underpaid and denied claims. AppealsPlus™ is a cloud-based solution that automatically analyzes ERAs, applies rules to place suspect payments and denials into appropriate work queues, and utilizes dashboards and key performance indicators to provide quantitative management and used to help drive decisions. The word that most succinctly describes the healthcare industry is uncertainty. The regulatory climate moves quickly and can change directions rapidly, leaving little time for providers and their patients to adjust. Providers don’t know if their patients will be able or willing to pay the bills after a procedure is performed. What most studies, vendors, and software companies fail to take into account is that the definition of a denial is subjective. This definition differs by physician, biller, and institution. A Software as a Service (SaaS) technology for rapid deployment without capital expense, so return on investment is immediate. On the bottom portion of the home screen managers will be able to view a detailed summary of their employees and their productivity level. This makes it easier to help improve the weekly, monthly, and yearly goals of your workforce with an easy to understand chart. AppealsPlus™ lives up to its expectation and automates your denial management processes. It's a SaaS-based solution that provides the ability to manage your denials from anywhere and at anytime. 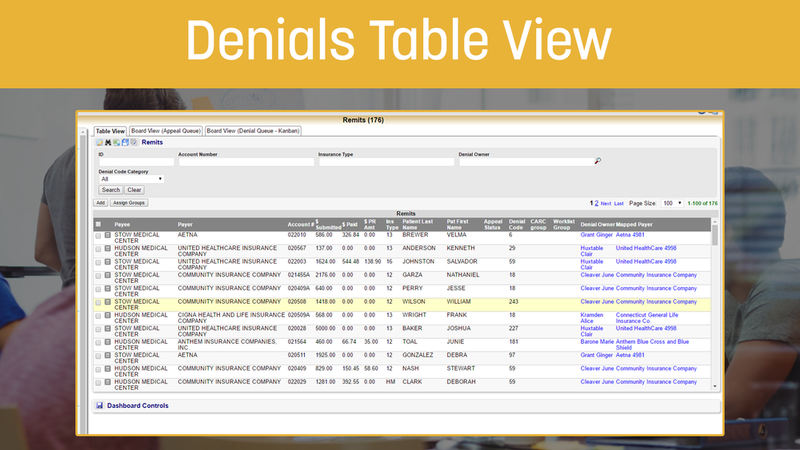 From within the denials portion of the solution can view your important accounts from three different views - Table, Appeals KANBAN board, and Denial Queue KANBAN board. Once one of the cards from within the Denial or Appeal KANBAN Boards is clicked an expanded, detailed view will appear. From within this window you can view all of the data that is pertinent to that particular appeal or denial. The data you can expect to see from this view includes check information, appeals information, claim information, any scheduled activities, and all of the logged activities for a particular denial or appeal. If you click on a document you would like to view on the bottom section of the Denial Card Viewer, another window will pop-up on your screen that gives you a detailed, interactive form where you can physically go into each section and fill out the information. These interactive PDF forms decrease the probability of an error and increase the productivity level of your employees. The first category of interactive graphs built within the solution is the Denials by Code graph. This graph displays your denial amount versus the total denial count. The denial amount is on the bar graph where the denial count is on the line graph. This gives you a great overall glimpse into the health of your organization. The third graph on the list is the Denials by Group graph. This is a great graph for looking at your total number of denials broken down into different categories based on their status. There are multiple different categories that are instantly displayed on this chart to help you analyze your biggest problem areas. Users within the solution can select navigate between the different interactive charts by clicking the top left drop down bar. The second graph on the list is the KPI Trends Chart. This chart compares your total number of claims, both approved and denied. This chart quickly gives you an idea your conversion ratio. The Denials by User interactive chart built within AppealsPlus™ gives you stacked overview of your denials by denied dollars and denials by count. You can quickly and easily go through each year, simply click on the year category drop box. We took it one step further by allowing users to also sort through this chart by specific facility. We understand how inconvenient it can be to manually input and create your own reports. AppealsPlus™ offers more than ten different ways you can automatically create reports that show different aspects of your appeal and denial process. Simply click on a category of report that you would like to see and it will automatically generate and download the related information as a Microsoft Excel file. We've implemented a CARC & RARC Library into AppealsPlus™ to give you the ability to use whatever terminology you want. We understand that different providers, insurance agencies, and hospital groups communicate with different terminology so we've made it easy to adjust between them. Within AppealsPlus™ you have the capability to generate Microsoft Word documents, similar to the Forms capability. Simply put in the information that you would like to be generated and AppealsPlus™ can auto generate cover sheets in the most common .doc format. We'll take you and your team through a personalized four week long implementation phase to ensure that the solution is customized to your liking. After the initial four week implementation phase you can continue to contact us with any questions or concerns you have. We pride ourselves on the customer service we bring to our valued clients. We'll help you check the vital signs of your organization to monitor both the strengths and weaknesses of your revenue cycle. We pass your data under a virtual MRI to help you uncover and prevent revenue leaks, provide education to define best practices, prepare for payer negotiations, calculate asset valuation, and discover red flags pertinent to merger activities with our Revenue Vitals Report technology. Reports can be run in real-time and the denials discovered through Revenue Vitals can be worked through innovative work queues. We can make the Revenue Vitals Report as detailed as you need. It's simple, give us a general idea of the information most important to your organization and we'll produce the report exactly how you want.